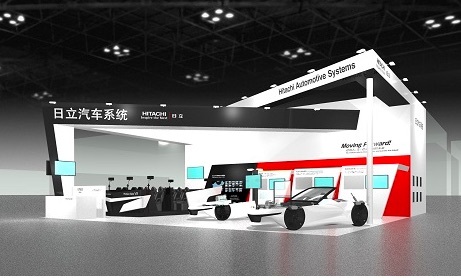 TOKYO, Apr, 08 2019 - (JCN Newswire) - Hitachi Automotive Systems will exhibit at Auto Shanghai 2019 - The 18th International Automobile Industry Exhibition, which will be held from April 16-25 in Shanghai, People's Republic of China. During this exhibition, the company will exhibit a wide range of automotive technologies and products that will support the next generation of advanced vehicles, with a focus on technologies for electrification and autonomous driving. The theme of the exhibits will be Moving Forward! To a Future Linking People, Cars and Society. The automotive industry is currently undergoing a once in a century transformation, propelled by rapid technological innovation in fields such as electrification and autonomous driving. In China, the world's largest automotive market, increasingly strict environmental regulations have been enacted, including the enforcement of the New Energy Vehicle (NEV) regulations from January 2019. In light of this situation, automotive manufacturers are launching many new vehicle models such as electric vehicles (EVs) and hybrid electric vehicles (HEVs), with China seeing accelerated adoption of environmentally friendly vehicles. Furthermore, China is currently facing societal challenges, such as traffic accidents and traffic congestion, and through government and private industry collaboration, the development of autonomous driving technology has been rapidly promoted as a measure to solve these challenges. In addition to automotive manufacturers, companies from other industries such as IT are entering the market, driving the accelerated development on new technologies in China. At Auto Shanghai 2019, Hitachi Automotive Systems will showcase technologies such as vehicle electrification and autonomous driving systems, which will contribute to solving the challenges currently facing automotive society. Moving forward, Hitachi Automotive Systems will focus on solving the challenges of a mobility society by offering next generation automotive technologies. At this exhibition, Hitachi Automotive Systems will exhibit in the Hitachi Booth (Booth No. 5BF-025) at the Shanghai National Exhibition and Convention Center. The exhibits will be divided into the following sections. In addition to "electrification technology" such as motors and inverters, there will also be exhibits of "360 degrees sensing technology" to detect the surrounding situation by combining peripheral recognition sensors such as cameras and radars, and "safety control technology" such as chassis products and control units that control the vehicle based on the information detected. An autonomous driving system realized through the coordination of these technologies will be fitted to a showcase car for a virtual display combining actual equipment and video footage. Panels, video and actual machines will introduce our core technology and concepts for electrification, the demand for which is growing such as for compliance with ZEV regulations. Videos will introduce the demonstration runs of our autonomous driving systems, which contribute to safe, secure and comfortable autonomous driving. An introduction will be given to our engine combustion control systems which can reduce the amount of CO2 emitted by converting fuel energy into kinetic energy without waste and improving the thermal efficiency. Videos will introduce our control systems for each of "combustion," "heat" and "energy," as our next generation high efficiency engine systems aiming for even higher fuel economy. The autonomous driving technology of the Hitachi Group can be experienced in the eight-person VR Ride Theater with a realistic 360 degrees three-dimensional image. When wearing the headset, visitors can enjoy the powerful travel scenes of the autonomous driving of the future. Hitachi Automotive Systems, Ltd. is a wholly owned subsidiary of Hitachi, Ltd., headquartered in Tokyo, Japan. The company is engaged in the development, manufacture, sales and services of automotive components, transportation related components, industrial machines and systems, and offers a wide range of automotive systems including engine powertrain systems, electric powertrain systems and integrated vehicle control systems.